Give your assembly the music they need to celebrate Mass in Latin! A meticulously researched new music resource, Laus Tibi, Christe presents 71 chant and choral settings of Mass parts, hymns, psalms, canticles and Marian antiphons, all in Latin. Intended for use by the assembly, it includes music for seasons and solemnities throughout the liturgical year. When used as a supplement with any major hymnal, this new resource provides the broadest collection of Latin texts for liturgical use published in the last 20 years! 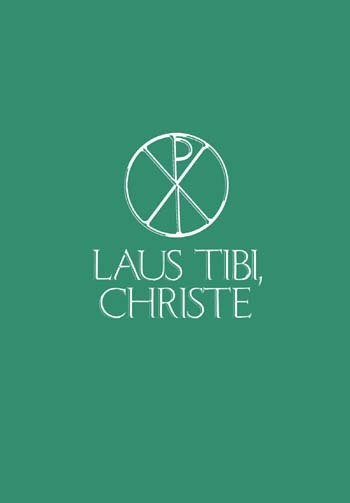 Laus Tibi, Christe offers familiar, ancient texts and music as well as those recently composed in the traditional style, including hymns by well-known text writers Harry Hagan, OSB, and Genevieve Glen, OSB. Selected with the help of internationally recognized Gregorian chant experts Columba Kelly, OSB, Dean Applegate, Edward Schaefer and Anthony Ruff, OSB, the 71 titles reflect a balanced repertoire that addresses the needs of communities that are new to Latin chant and those with a long tradition of using them. Gives you everything you need for the celebration of the Mass in Latin! Offering a balanced repertoire of 71 chant settings, this meticulously researched music resource is designed to meet the needs of communities new to Latin chant, as well as those with a long tradition of using them. A wonderful complement to your existing missal or hymnal program, Laus Tibi Christe provides the broadest collection of Latin texts for liturgical use.